If you knew exactly where your charity dollars were going, would you donate more? If you could meet the people in your community who you knew would be positively impacted by your donation dollars, would charity become a bigger part of your budget? For many people, the answer is a resounding yes. Last week, I had the pleasure of experiencing Impact Club, a collection of venture capitalists who are putting their money where their hearts are. They call it “Elevated Philanthropy”. For those familiar with internet crowdfunding, the basic premise behind Impact Club is clear. While it may seem out of the realm of many of us to make a large financial contribution to a local charity, many people coming together to make smaller donations to one source can really make, well…, an impact. The model is simple. Each member commits to donating $100 per quarter. For those playing at home, that’s $33 and change per month – less than a week’s latte or lunches. At a quarterly meeting, three local charities present their need and their plan for how to spend the money, should they be the recipient of the donation. Impact Club members then vote, and each member writes their check to the winning charity. No processing, no middle men – 100% of the $100 each member gives is put directly into the hands of the charity presenting the most pressing need. I brought my two daughters (Chloe,9, and Emily,14) with me to the local Impact Club meeting. From the moment we walked in, we were absolutely floored by the amount of positivity in the room. This was a room full of people feeling empowered – both those who were presenting to receive a financial donation for their charitable organization, and those who were giving. The electricity generated by people coming together to make a difference in our community was palpable. In the age of the internet and social media, where giving is often done with via a click or a text, it meant a lot to have my daughters see real-world connections, local folks brought together by their desire to help. The Wilmington, NC club is one of several pilot clubs forming in cities across the United States including Boise, ID; Fox Cities, WI; Union City, CA; Eugene, OR; and Yuma, AZ, just to name a few. 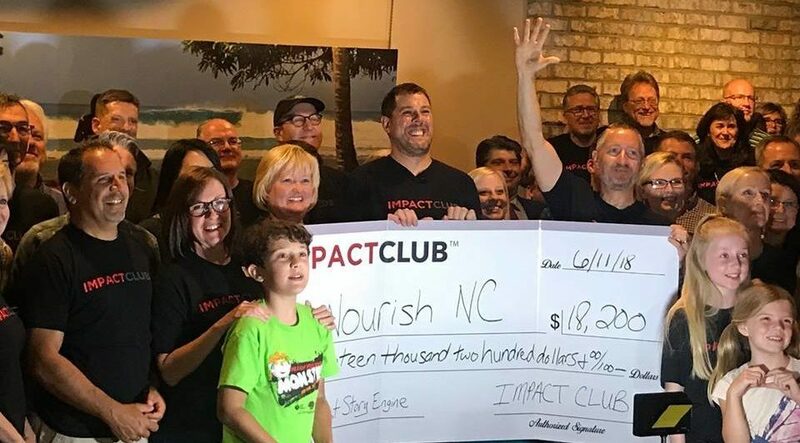 Wilmington’s winning charity this quarter was Nourish NC, a local non-profit bringing summer lunches to the 1 in 4 children in New Hanover County who struggle with hunger. The group presented them a check for $18,200. It’s causes like this that make Impact Club really count – feeding hungry kids in our own backyard. And, there’s another benefit: thanks to the experience, my daughters are more eager to help others, too.